Extreamophile community structure at geothermal features is controlled by many environmental parameters of which temperature is a possible direct control and an influence on others. Microbial extreamophiles at geothermal features display a horizontally varying community structure in relation to the thermal gradient created by the shallow flow from the features. My study looks in particular at the community structures at the El Tatio Geyser Field in North Eastern Chile. The hydrothermal features at El Tatio release water at 86˚C (the boiling point at 4200 m) that can cool by 20˚C within 1 meter of the feature. 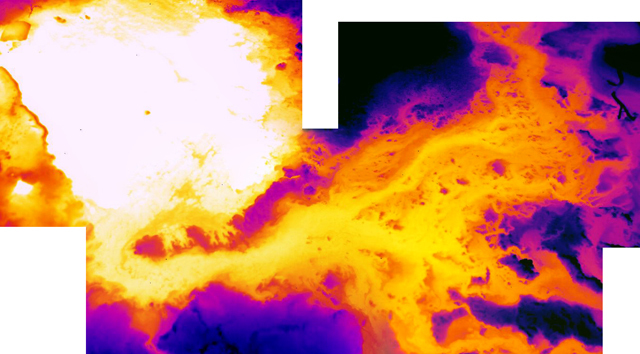 These temperature gradients are remotely measured at an unprecedented scale using a thermal infrared (TIR) camera. TIR images were collected from 4 features with a precision of 0.06˚C for 30,7200 temperature values per image with each value roughly representing 1.5 mm2. Digital color images were simultaneously collected and each organism defined my their RGB value. I then overlay temperature maps on the color map in hopes to derive the significance to which these boundaries are related. My study seeks to show that this relation is significant and I hope to expand our knowledge of horizontal microbial community structures. 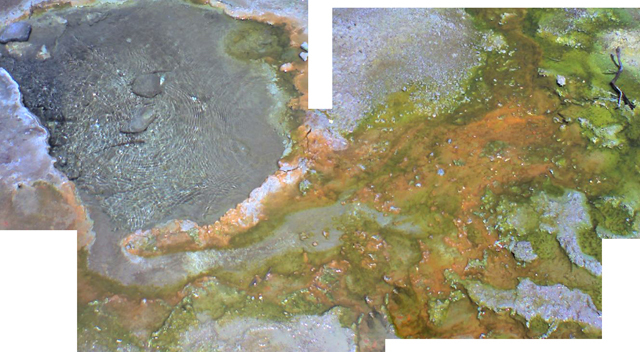 Digital image of a microbial mat around a hot spring.